Work is “well underway” at the Osborne Naval Shipyard in Adelaide, where the nine anti-submarine warfare Hunter Class frigates will be constructed. The above image shows the erection of structural steel for the shipyard's high Block Assembly Hall, where the blocks that make up each frigate will be built. When completed, the building will measure 28 metres high, 160 metres long and 47 metres wide, but will be "dwarfed" by the Ship Erection Hall alongside. Osborne Naval Shipyard will also be the build location for Australia's $50 billion Future Submarine program. 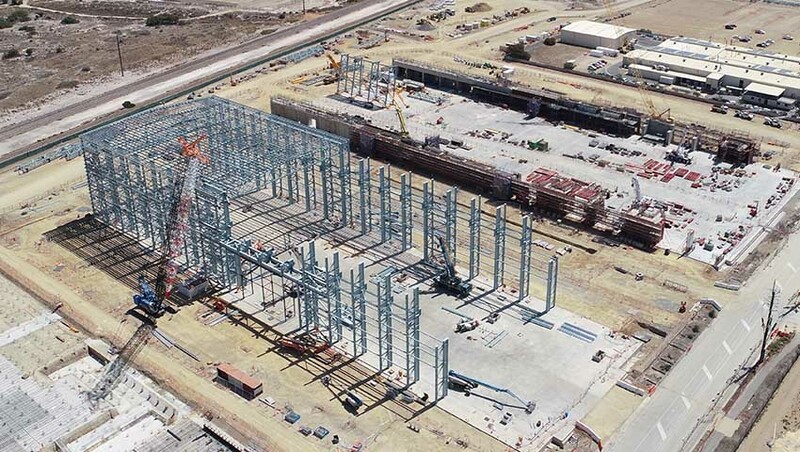 In what has been a boost for Australian suppliers, 89 per cent of the 25,500 tonnes of steel used on the Osborne South Development Project has been sourced from local suppliers, with steel fabrication and installation undertaken by local companies. ASC Shipbuilding has commenced mobilisation and design work on the Hunter Class frigate program, with prototyping to commence next year, followed by the construction of the first frigate in 2022. The program will create and sustain over 5,000 jobs across BAE Systems and the "wider Australian defence supply chain" over the course of the project. Easy access to the national transport network, including road, rail and deep-sea port. This facility will form part of BAE's 'Digital Shipyard' concept, which will see the joint BAE/ASC workforce deliver the vessels from the early-to-mid 2020s. The digital shipyard concept will ensure that every aspect of the ship during the design and build and throughout its service life is live and accessible to the crew as well as all those involved in the maintenance and upgrades of the fleet and approved suppliers. People will be connected in their place of work to assured, readily understandable information and processes to evidence-based working in real-time. Digitisation will also bring the ‘ship to life’ during its service life. Intelligent systems, on board and linked to those ashore, will monitor the performance of the ship and its systems, allowing ship’s staff to focus on the right tasks and ensuring that the right parts and specialist help are available before they are needed. BAE's digital shipyard will include an inventory of parts, including cost and acoustic signature, suppliers and their details, providing Australian industry the opportunity to improve upon all parts and systems used in the construction of the Hunter Class frigates. The Commonwealth government will retain a sovereign share in ASC Shipbuilding while BAE manages the $35 billion SEA 5000 program. At the end of the program, the Commonwealth will resume complete ownership of ASC Shipbuilding, thereby ensuring the retention in Australia of intellectual property, a highly-skilled workforce and the associated equipment. Frontline Manufacturing achieves ISO certification... - 13 hours ago.